One of the benefits of a community like Maplewood/South Orange is its proximity to NYC and that means that we have a lot of Broadway performers that will happily share their acting and singing with us. So, join us for the Second Annual Broadway FurBall, when Local Broadway Stars from such Broadway hits as Mamma Mia, Lion King, Wicked, Les Miserables, Phantom of the Opera, Mary Poppins, and many more sing classics about - or to - their pets! 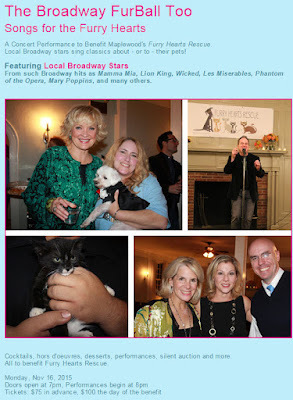 StagedRight Homes is a lead sponsor for the 2nd Annual Broadway FurBall, a fundraiser for Furry Hearts Rescue. 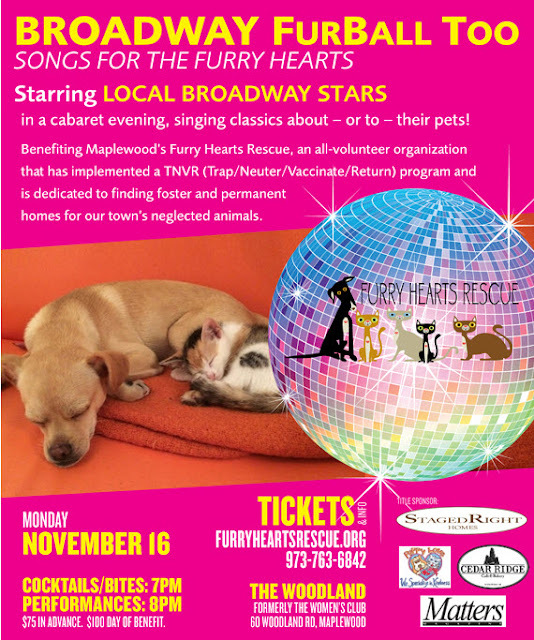 Join us November 16 at the Woodland in Maplewood for a cabaret evening. Furry Hearts Rescue is critically low on funds and needs your support now, more than ever before. Our effort and commitment to TNVR in Maplewood continues to grow — as does our intake of rescues. From traps to vet care to food, our expenses are numerous. And without the help of our generous community and tireless volunteers, FHR cannot continue this important work. So please consider donating today. Thank you. And remember, all donations are tax deductible! Wish List With just a click of a button you can help feed and care for our rescues and vetted ferals. Order from our online supply list and have the items shipped directly to Puppy Love, located at 1835 Springfield Avenue, Maplewood, NJ 07040. Puppy Love All donations are being accepted at Puppy Love, located at 1835 Springfield Avenue, Maplewood, NJ, 07040. Cash or gift card donations are preferred, and we will happily provide a tax receipt upon request. Furry Hearts Rescue has taken in several cats, kittens, puppies and even a few dogs in the last month. We are also very busy trapping and vetting Maplewood Township’s feral cat colonies. All adoptable cats and kittens from these colonies are in search of forever homes. Besides the basic needs of our adoptable pets, there are also administration costs to running a rescue, so we thank you in advance for your donation. Please see below for our list of needed items. Do you have older linens or towels you do not need anymore? Furry Hearts Rescue is in need of dog and cat beds, blankets, linens and towels to keep their adoptables comfortable in their crates. The rescue also needs quality cat food, cat litter, dog food and other pet supplies. All donations can be dropped off at Puppy Love: 1835 Springfield Avenue, Maplewood, NJ 07040. As your Maplewood/South Orange/Millburn/Short Hills/Essex/Union County New Jersey listing agent I am well versed on as your local expert in all things in the Maplewood and South Orange area Real Estate Market. You can expect personalized service that includes a detailed consultation on how to best position your Mid-Town Direct home to be competitive in today’s market with training to provide my clients with an in-depth Advanced Comparative Market analysis, and advice on staging. As my office’s technology officer as well as both a Zillow Platinum Premier and Trulia Premier agent, I use the latest and most up-to-date marketing methods to get your home in front of as many buyers as possible. Being your New Jersey Real Estate Agent and Realtor ® not only involves just finding the home or selling the home, but being your guide, negotiator, advisor and advocate and making sure that your needs and goals are met. Being your New Jersey Essex/Union County area Realtor® (with a little bit of Morris County thrown in for good measure) is one of my truest passions, and “Helping You Find Your Dream Home” is my number one priority. What Mortage Product is Right For You When Buying a Home? Find your local mortgage loan limits at The Mortgage Reports. WHICH MORTGAGE SHOULD YOU CHOOSE? Ten years ago, it was tough to get a mortgage. Lenders were stingy and guidelines were tight. Few loans were approved and the housing market suffered. Today, the mortgage market looks different. Home values have (finally) surpassed last decade's peak prices, and mortgage lenders are more willing to make loans than during any period this decade. More than 70% of purchase loans are getting approved right now, according to Ellie Mae, whose mortgage software helps to process more than 3.5 million loan applications annually. This is the largest approval percentage since such data has been tracked. But, there's more to it for today's buyers than just "Will my mortgage get approved?". There are more mortgage choices available than during any part of this decade, too. A proliferation of low- and no-downpayment mortgages have helped spur homeownership among long-time renters; and the return of the 80/10/10 loan is making it easier for existing homeowners to "move up" to something bigger. Not sure which mortgage loan is best for you? This chart should be a help. WHAT MORTGAGE OPTIONS DO YOU HAVE? The mortgage market is expanding. Mortgage lenders are offering new products for the first time in a decade; and, it's getting easier to getting approved for low- and zero-downpayment mortgages. However, it's not always clear which loan is best for your needs. For example, just because you qualify for an FHA loan, should you use one? Or, if you're eligible for a 100% USDA loan but you plan to make a downpayment of 10 percent, should you still use the USDA loan for your purchase? To help you with your mortgage choices, The Mortgage Reports presents this flowchart. The graphic uses three specific loan traits as a starting point -- (1) Downpayment Amount, (2) Loan Size and (3) Credit Score -- then follows-up with specific questions to help you find your "optimal" mortgage loan program. In addition to identifying conventional loan opportunities via Fannie Mae and Freddie Mac, the flowchart identifies loan possibilities via the Federal Housing Administration (FHA), via jumbo mortgage lenders, and via niche mortgage programs including the USDA Rural Housing loan, the Department of Veterans Affairs VA loan, and the Fannie Mae Conventional 97 program. What is your local loan limit? Are you borrowing more than your local loan limit? Do you plan to make a downpayment of 20% or more? Do you plan to make a downpayment of 5% of less? Depending on your answers to the above questions, the flowchart might recommend a conforming loan with private mortgage insurance (PMI); or a jumbo mortgage that allows for loan sizes in excess of your local loan limits; or some different program which may be more suitable. Your loan choice may also be affected by where you live. Buyers in less-densely populated areas may find the USDA Rural Housing program to be their best fit. Note that 97% of the United States is "USDA-eligible" and the USDA mortgage allows for 100% financing. Furthermore, buyers may be routed to specific loan program depending on whether their downpayment is a gift from family, or is sourced from their own funds. Once you've found a suitable loan program, pump your numbers into a mortgage payment calculator to determine your expected mortgage payment (and make sure you're using accurate mortgage rates). When you know your expected monthly payment, you can better budget for a home -- whether you're buying today, next month, or next year. Living in Maplewood: Free Health Clinics ranging from Hip Pain to Sleep Disorders and more! Are you suffering from hip pain? Is it affecting your way of life? This Thursday is your opportunity to speak with a healthcare professional about hip issues and hip replacement options. Join us this Thursday for a presentation by Dr. Timothy Henderson, Board Certified Orthopedic Surgeon for the Fall Healthy Inside and Out Lecture Series, provided by Saint Barnabas Medical Center and provided through the Maplewood Health Department. All programs are free and open to the public however registration on Barnabas Health Link (888) 724-7123 is highly recommended. Please go to www.maplewoodlacrosseclub.com for further information and to access registration. Our little family of five just made the move to Maplewood this past week after about a year of looking all over Queens, Beacon, Rockland County (Nyack, etc), Westchester (Tarrytown, Ossining, Peekskill, etc) and, finally, Maplewood. After having heard so much about how many people were moving here from NYC, we were thrilled to have found a house that's walking distance to the excellent-rated elementary school, the community pool and two libraries, as well as having a direct train to Penn Station. When we came to look at open houses, it was almost as if the entire neighborhood had been staged — kids walking to soccer practice at a nearby park, father and son riding their bikes, kids hanging out on a stoop across the street. Having known or heard of so many Brooklyn families that were moving here made it seem as it had been vetted. Feel free to reach out with any questions! Mark Slade: Bruno agreed to let me repost this group reply. 1 SOPAC Way, South Orange, NJ, 07079. See the dynamic duo! Grammy Award-winning traditional folk singer-songwriter Loudon Wainwright III along with songstress and Broadway actress Nellie McKay. South Orange Performing Arts Center, One SOPAC Way, South Orange. 8pm. $35-$55. (973) 313-2787. www.SOPACnow.org. The Vienna Boys Choir is a musical tradition that dates back over 500 years. Until 1918, the choir sang exclusively for the imperial court, at mass, at private concerts and functions, and on state occasions. Today, however, with a repertoire that includes everything from medieval to contemporary to experimental music, over 100 choristers travel the globe in four different choirs performing music to over a half million people in Europe, Asia, Australia, and the Americas. A staged reading presented by Midtown Direct Rep.
Leon Russell is a Rock ‘n Roll Hall of Famer who has been performing his gospel-infused southern boogie piano rock, blues, and country music for over 50 years. He is a music legend and perhaps the most accomplished and versatile musician in the history of rock ‘n roll. In his distinguished and unique career, he has played on, arranged, written and/or produced some of the best records in popular music. South Orange Performing Arts Center, One SOPAC Way, South Orange. 8pm. $38-$58. (973) 313-2787. www.SOPACnow.org. November 15: Theatre in the Loft: What God Hath Wrought! Join us at the 18th annual Giants of Jazz celebration! Honoree George Cables will be joined by some of the greatest names in Jazz in this star-studded night of music. February 7: Bill Sims, Jr.
SOPAC programs are made possible in part by the New Jersey State Council on the Arts. 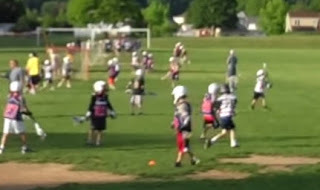 The South Orange Performing Arts Center (SOPAC) is a 501(c)(3)charitable organization. Since 2006, SOPAC has been serving as a premier performing arts center in the region. SOPAC offers innovative artistic and cultural experiences for diverse audiences in an intimate, inviting environment. The premier arts center hosts a variety of live performances, community events and education programs for all ages. To further expand its offerings, SOPAC has a partnership with the Juilliard School of Music to present Juilliard @ SOPAC—a series featuring upcoming musicians from the acclaimed conservatory. SOPAC is home for Seton Hall University Arts Council’s performances, including Classical Concert Series, Jazz N’ the Hall performances and Seton Hall Theatre productions. SOPAC also presents performances by its theater company in residence, Midtown Direct Rep, and its dance company in residence, Lydia Johnson Dance. For more information, visit SOPACnow.org.